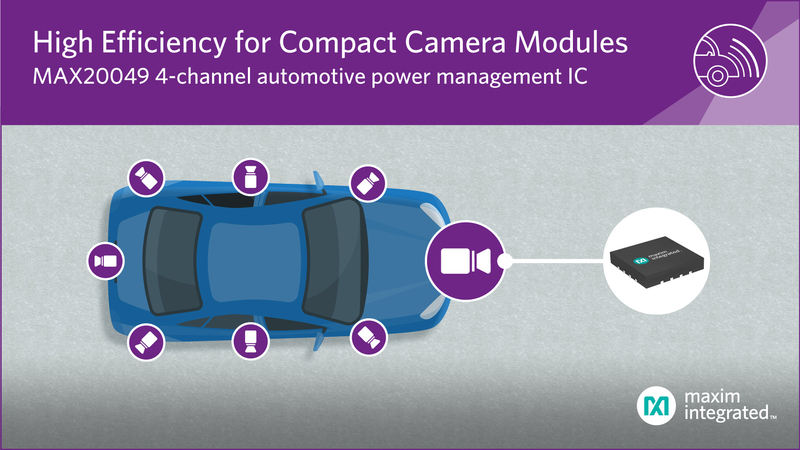 MUNICH, Germany – March 25, 2019 – With automotive camera modules becoming increasingly smaller, designers can now utilize the ultra-compact MAX20049 power management IC from Maxim Integrated Products, Inc. (NASDAQ: MXIM), which integrates four power supplies into a tiny footprint. In addition to being the most compact power management IC for vehicle camera modules, it delivers the highest efficiency on the market today. The MAX20049 offers many options to support various output voltages, while also providing fault mitigation by flagging faults and shifts in output voltages.